So I was able to run the Bus Pirate with an older driver under various Windows flavours but there is still the fact that it also should work with the latest drivers. Kamcm on the Dangerous Prototype forum digged up some links to the Arduino forum where folks were discussing the problems of a counterfeited FTDI chip. He might be right with that. I asked Kevin from Seeed Studio if I could help them further (without having to send the “working” Bus Pirate) to China. Some Bus Pirate devices that can’t run the latest driver already arrived at the store so we checked the part numbers. 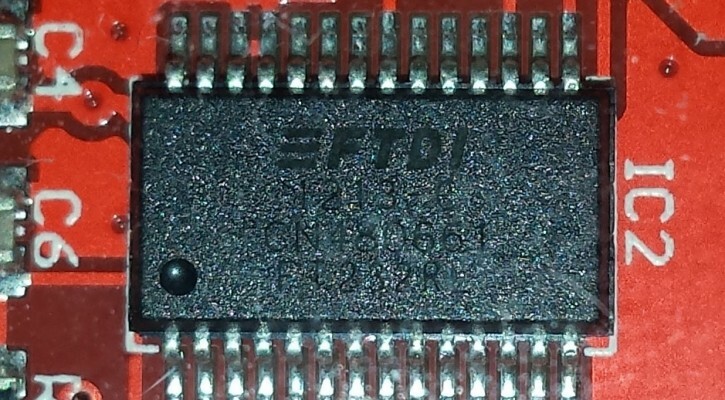 One look at the the silk-screen on the FT232 chip tells us that my little BP could be a counterfeit. 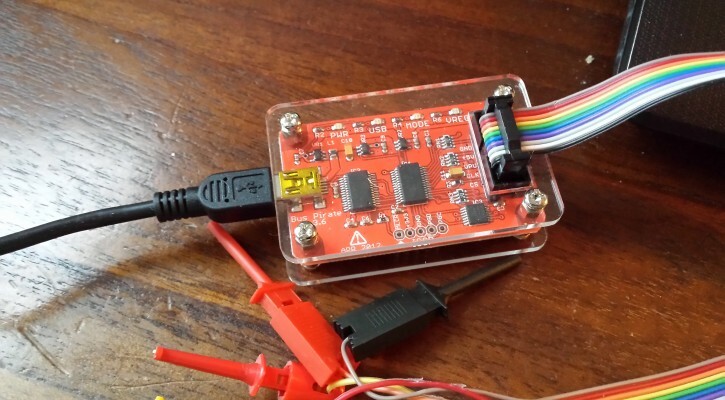 Seeed is investigating this chip with FTDI and has send some of the chips to a “counterfeit authenticate lab center”. 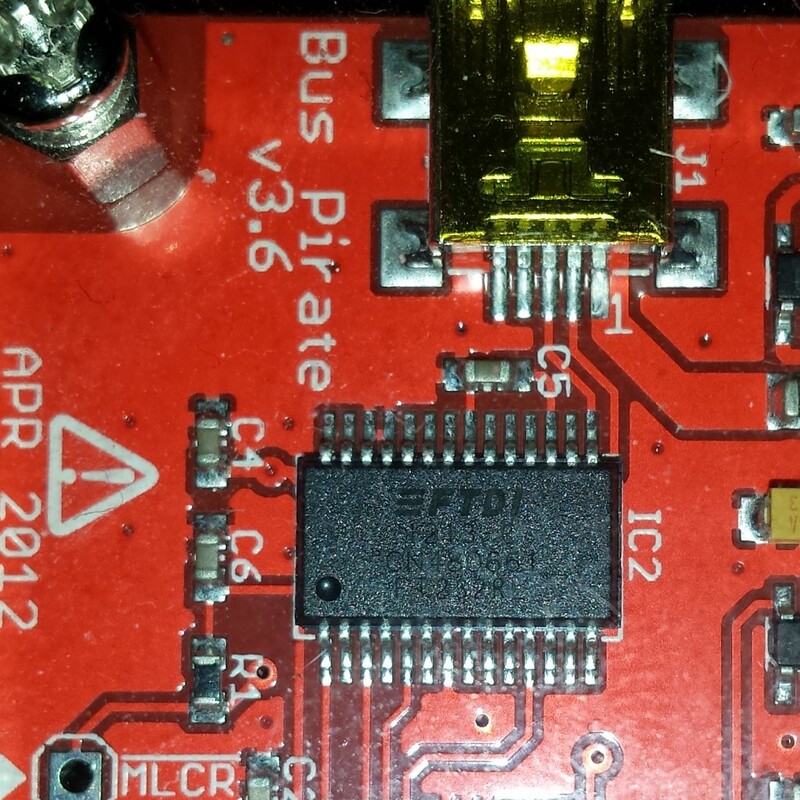 FTDI counterfeit chip on a Bus Pirate? Its good to know that Seeed and Dangerous Prototype (and the people on the forum) are digging into it. Its easy to buy these parts thinking they are the real deal. My guess there went something wrong in the supply chain and they bought a batch of bad (rejects) or counterfeit products. I been a couple of times into shenzhen and it is terrible hard to distinguish between genuine and fake parts (and all the variations in between). The price of the part doesnt always tell the difference. Seeed (and I think most manufacturers) have a selected trusted sources for their parts, but sometimes it slips through. We will wait and see. Seeed wil contact us when they know more about the chips. Time will tell. In the meanwhile I am able to use the Bus Pirate with the older driver and one piece of hardware I don’t want to work without anymore. Share the post "FTDI counterfeit FT232 chip?" The Bus Pirate v3.6 from Dangerous Prototypes arrived. So I followed the links on the wiki and installed the latest drivers on my windows 8.1 machine. Ready to go right? Nope. Looked in device manager and the drivers are installed and do not have any warning signs in front of it. Putty has some sort of connection and the PWR LED on the Bus Pirate is on. But I can type whatever I want into the terminal but nothing happens. As you can see the GUI says No too. Well lets see if I can upgrade the bootloader. There is a “hello world test” on the cmd-prompt. When you connect the PGD and the PGC the MODE LED lights up. Ok, thats good! Darn. So I am into my “WTF mode” and installed the drivers on the windows 7 machine. Same error. More shouting and cursing. Blame windows 8.1 and windows 7 so lets try it on the test machine (Vista). Nope, nada, nee! 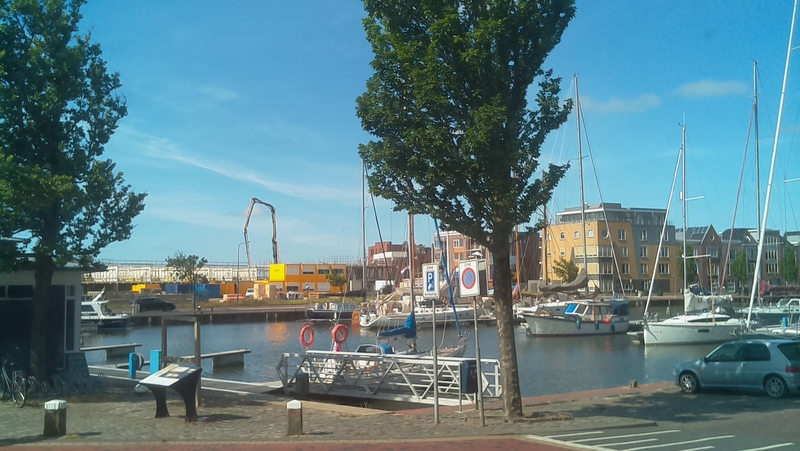 More cursing and shouting but that did not help me further either. Now I am at the boiling point. Seeedstudio customer support (thanx Kevin!) was good (Seeed are the people who shipped it) and asked me all the things I already tried out so we could easily exchange errors and screenshots. Done that, been there, tried that.. After many emails forward and back, Seeed asked me to send the board back and they would return me another one. Frustrated as I can be (why can’t I get it to work under all those windows flavours) I decided to do one more trick. I booted into my favorite Linux distro Crunchbang. 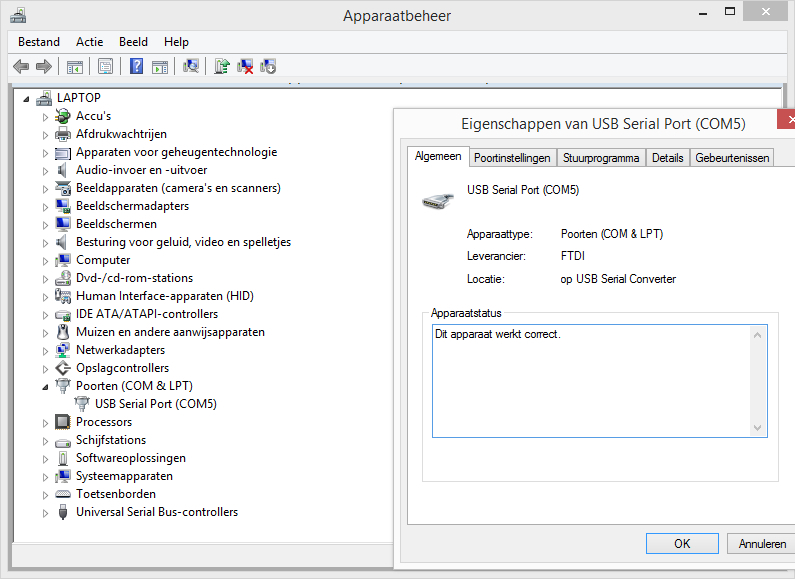 I expected to see some errors in the log’s about the USB connection that might help me or the folks at Seeed to debug the error. To my surprise there was a /dev/ttyUSB0 available! And there it was! YES: Houston we have a connection! First things first: Tried the self test to make sure everything was working ok and while I was on it I upgraded to the latest firmware. Now I was sure the Bus Pirate worked, the latest firmware was on it. Back to windows and go go go! Well the computer/putty said no again. I decided to uninstall the drivers and try the “older” ones (2.08.28). Now there this is the tricky part. First you need to uninstall (from within the device manager) the drivers and make sure you also remove the files. There is a checkbox you need to check! Somehow I installed the the drivers two times and to make sure the were gone to I had to check “show hidden drivers” under view. And remove them also. Almost there! If you are like me you have a download or driver installation directory. Delete the 2.08.30 installation drivers or windows will look in there and will use those again. 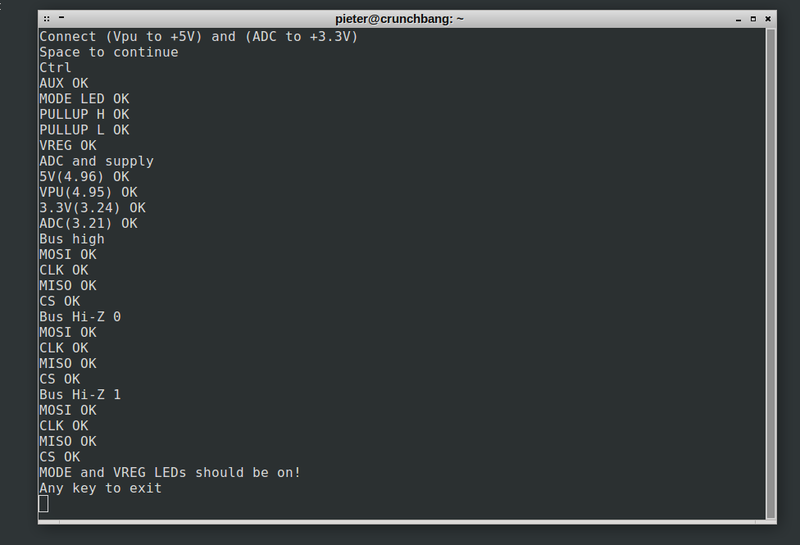 Anyway, Installed the 2.08.28 drivers from the FTDI download page and then started a putty session. Checked COM port, Baud Rate and and and…YES! Putty and the Bus Pirate worked! I also did the same on the win7 and win Vista machines and same thing. a Working connection between the machine and the bus pirate. Now, I still think its strange that the latest drivers from FTDI wont work with the Bus Pirate.. But I am glad that this worked. The folks at Seeed were happy to know that this might be the solution for some of us that write them that their Bus Pirate is bricked, DAO or broken. In the long run I learned a lot about the Bus Pirate, reading the wiki and learning from the folks at the forum. You can do a lot with this tiny gem. 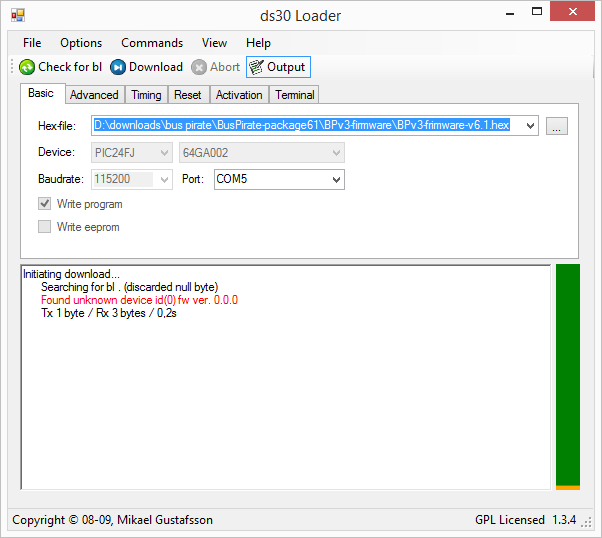 Share the post "Bus Pirate v3.6 Communication error fix for Windows"